Rajinikanth Film Review From Mundru Mugham. Mundru Mugham Movie. 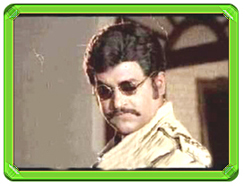 Rajini Film Mundru Mugham. Rajinikanth Mundru Mugham movie. www.rajinikanth.com. Rajni plays three roles. The father, an honest police official, is killed by corrupt elements. The sons, separated at birth, get together to take revenge. Rajni created one of the most enduring characters, Alex Pandiyan, in this movie. With pursed lips, hunched back, peering eyes and a swaggering walk, Alex was an unforgettable character. The second role was that of a criminal gone the wrong way before turning over a new leaf while the third was the typical tamil movie hero, romancing with the heroine and fighting. Overall a good movie elevated by a great performance by Rajni.